Csarina Catharina (1729-1796) is dressed as a man and her whole habitus is male in this painting. She wears the uniform of the Preobrazhensky elite regiment, also her body guard. Catharina holds her sabre upright as a whip, in line with the riding manuals of the time. Her seat is also exemplary. The grey stallion shows the type of the Lipizzan breed, characteristic for the barock period. Its name is mentioned as Brillante, so this is a portrait of her horse as well. Catharina was not only the ruler of Russia, but also active in the European cultural scene including the art of riding. Her equestrian portrait shows her dominating character but also her ambition to be an impressive rider. 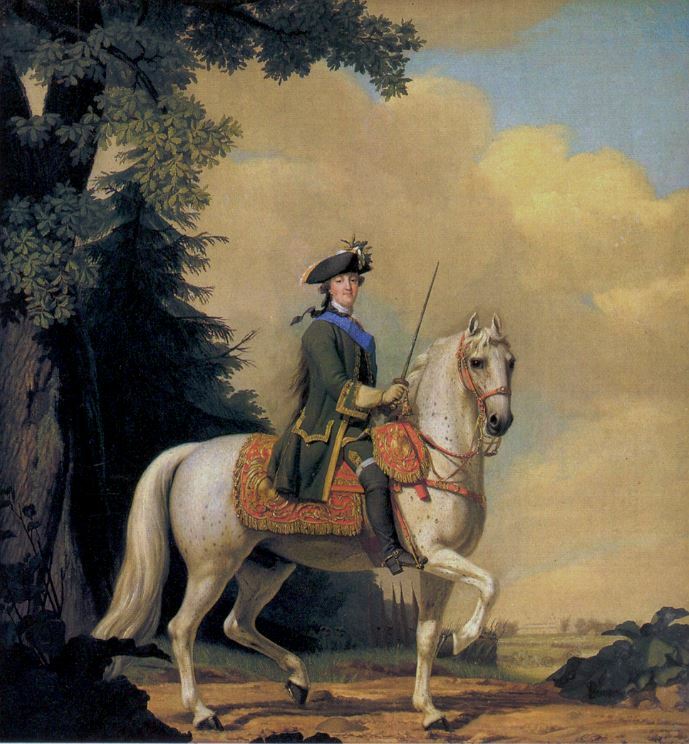 Eriksen made the first version of this portrait in 1762 for the Throne Room of the Peterhof Palace in Saint Petersburg, where it still is. The version shown here is smaller. The Hermitage Museum in Amsterdam devotes an exhibition to Catharina II and her life, starting 18 June 2016.